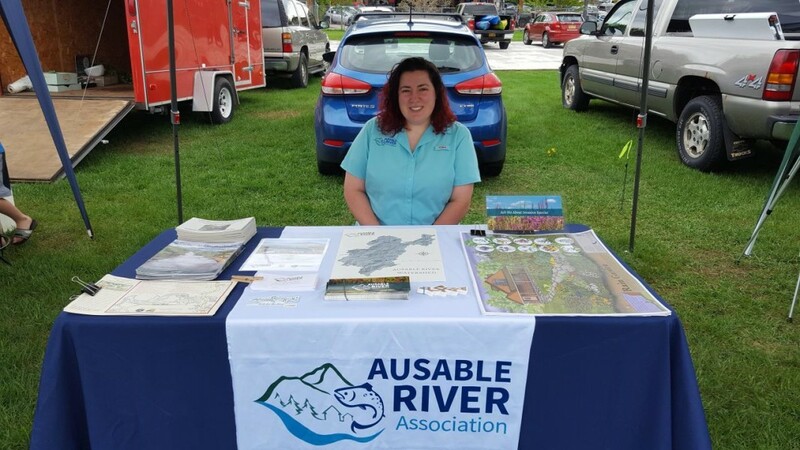 AsRA's River Steward Nicole Pionteck completed her fourth season of program education and outreach, speaking with hundreds of anglers, river users, and eventgoers in the Ausable watershed from May through October. The river steward program was created in 2009, with support from the Lake Champlain Basin Program to educate river users about the threat of aquatic invasive species. Since then, the work of the river steward has broadened to include terrestrial invasive species that also affect the Ausable River and its lakes. Since 2015, Nicole's skills in surveying and GIS have expanded the program even more, and not only does she provide information to river users and the general public, educating and creating awareness about invasive species and other issues affecting the watershed, she also assists AsRA staff with their work surveying and collecting important data. After a winter of grant writing, data crunching, and map making, Nicole planned her events for the year. 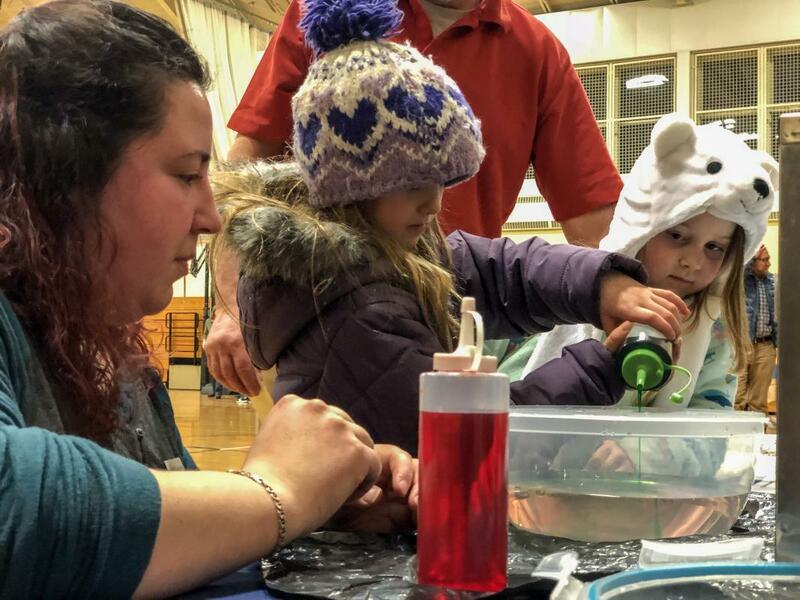 The first she attended is a favorite, the Keene Central School Science Slam which is held annually on the second Thursday of March. This science fair showcases student projects and invites outside organizations to bring their own demonstrations and educational materials. This year, to highlight the impact of road salt on our lakes and streams, Nicole brought an interactive, salty demonstration. She showed the kids how road salt laden water, coming out of pipes and culverts as runoff, settles to the bottom of a lake. Once there, it is difficult for the lake to mix, as demonstrated by a gentle shaking of the bowl "lake." Only aggressive shaking could mix the waters, which was shown to be essential for the health of aquatic organisms in the lake such as lake trout that depend on oxygen and nutrient mixing. Nicole helps a Science Slam participant add salty "culvert" water to the fresh "lake" water. In late spring, outdoor activities ramped up as AsRA hosted two volunteer riparian plantings. 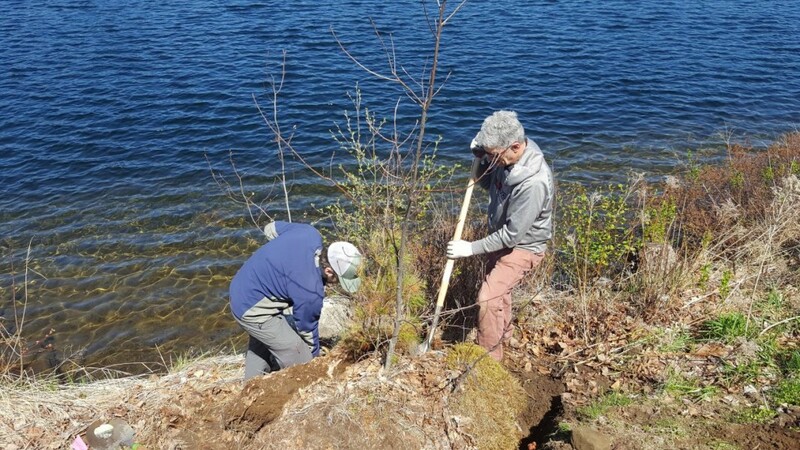 On May 21st, AsRA and volunteers from the Mirror Lake Watershed Association (MLWA) planted trees and shrubs along the sparsely vegetated east shore of Mirror Lake. The goal of this project, funded by an Earth Day Initiative Grant from Humanities New York, is to help revegetate and stabilize the lake’s shoreline with native, salt tolerant plants and will help to maintain good water quality and aquatic habitat, especially in this very developed area of our watershed. The shrubs planted will provide bank stability and be beautiful to look at for passing residents and visitors. The trees will provide stability, shade, and improvements to fish habitat in the future. AsRA's Science and Stewardship Director Brendan Wiltse and Mirror Lake Watershed Association Chair Bill Billerman help save an oak tree during the Mirror Lake Planting. Our next planting was a follow up to AsRA’s original riparian restoration on the fabled Dream Mile on the West Branch. On May 24th, Nicole and Northwood School L.E.A.P. students planted native trees and shrubs at the natural stream restoration site. Planting at our natural stream restoration project areas is crucial to stabilize the new construction and will, in the future, provide critical shade habitat for keystone species like native trout. In total, volunteers planted 300 trees and shrubs in critical riparian areas on Mirror Lake and the Ausable River in 2018. Nicole and L.E.A.P. students and staff pose after planting trees on a constructed lower bench at Dream Mile. In late spring and early summer, the river steward’s time is occupied with her Lake Champlain Basin Program Aquatic Invasive Species (AIS) grant tasks, including river user surveys, maintaining wader wash stations, keeping an eye out for aquatic and terrestrial invasive species, and attending public and AsRA events. The first AIS education event was the weekend-long Ausable Two-Fly Challenge that began on May 18. Nicole attended the registration event with a wader wash station for participants to use before heading out on the river and chatted with them at the fly tying event and banquet. During the fishing season from May to October she was on the river delivering the AIS spread prevention message (“Check, Clean, and Dry”) to over 400 anglers and boaters enjoying the Ausable River. In addition to the Two-Fly Challenge, Nicole attended various events throughout the summer and fall including Community Day, the Green Market, and Ironman in Lake Placid, Earth Day Celebration in Saranac Lake, the Keene Valley Farmer’s Market, and AquaFest and Festival of Colors in Wilmington. Nicole tabling at the Green Market in Lake Placid. 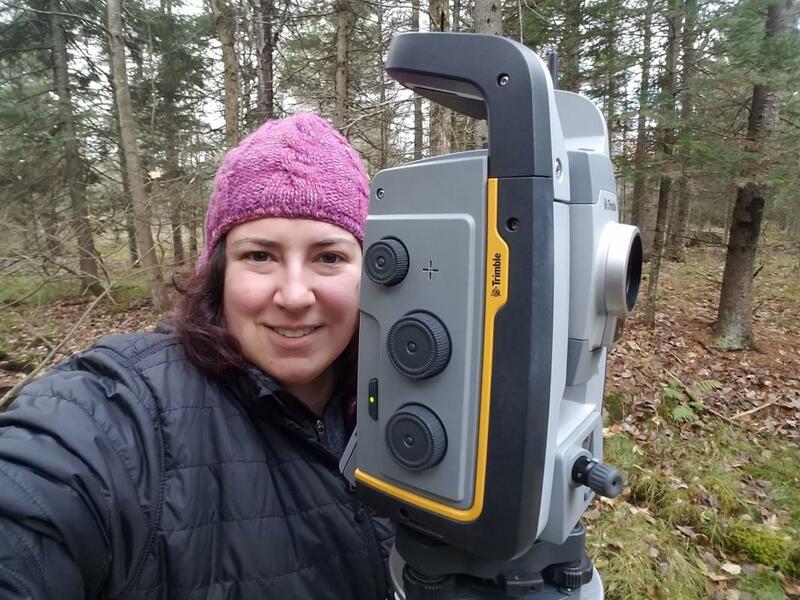 When not performing education and outreach in the watershed, Nicole helps gather data that informs AsRA’s understanding of the threats that face the Ausable watershed. She identified and removed several purple loosestrife infestations in Wilmington and Jay and partnered with APIPP’s seasonal intern Katherine Gale to paddle Lake Everest looking for both aquatic and terrestrial invasives. She also assisted with field work, helping cut and place coconut fiber mats at the Dream Mile restoration project, collecting and processing water samples for AsRA’s eDNA research with Science and Operations Associate Carrianne Pershyn, and setting up and operating a Trimble S7 Total Station that measured x, y, and elevation data that will inform East Branch restoration projects in the future with Executive Director Kelley Tucker. Now that the field season has ended, Nicole is writing reports and grants and is already looking forward to another season on the river. If you have any questions, you can contact her at nicole@ausableriver.org. Nicole assisting with geomorphic surveys using a Trimble S7 Total Station, lovingly dubbed Trixie.